Road claims • Clarification of statute could shape counties' ownership petitions. 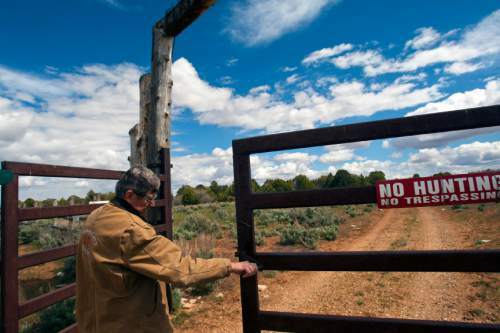 Chris Detrick | The Salt Lake Tribune Chris Odekerken opens the gate to his Elkheart Cliff Ranch on Glendale Bench Wednesday May 8, 2013. 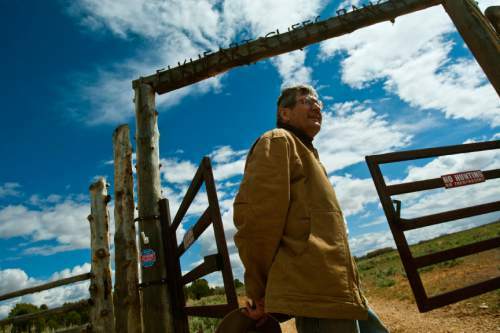 Chris Detrick | The Salt Lake Tribune Chris Odekerken at the entrance to his Elkheart Cliff Ranch on Glendale Bench Wednesday May 8, 2013. 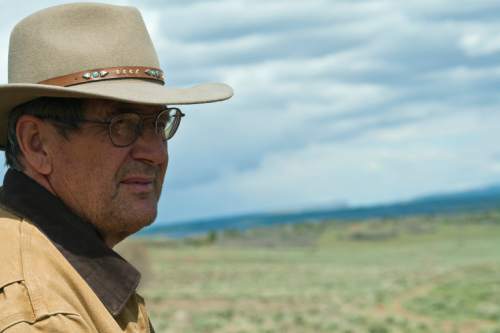 Chris Detrick | The Salt Lake Tribune Rancher Chris Odekerken poses for a portrait along K2825 on his property on Glendale Bench Wednesday May 8, 2013. 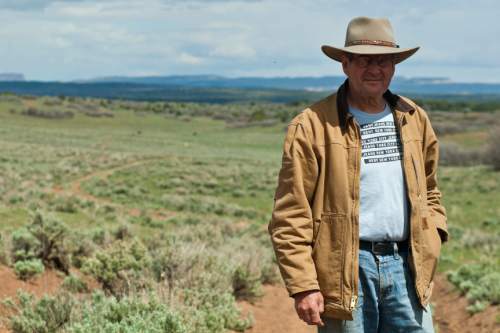 Chris Detrick | The Salt Lake Tribune Rancher Chris Odekerken poses for a portrait along K2825 on his property on Glendale Bench Wednesday May 8, 2013. 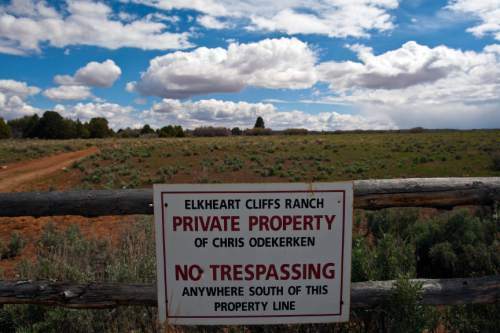 Chris Detrick | The Salt Lake Tribune A sign at the entrance of Chris Odekerken's Elkheart Cliff Ranch on his property on Glendale Bench Wednesday May 8, 2013. Chris Detrick | The Salt Lake Tribune A sign at the entrance of Chris Odekerken's Elkheart Cliff Ranch on his property on Glendale Bench Wednesday May 8, 2013. Chris Detrick | The Salt Lake Tribune A sign at the entrance of Chris Odekerken's Elkheart Cliff Ranch on his property on Glendale Bench Wednesday May 8, 2013. 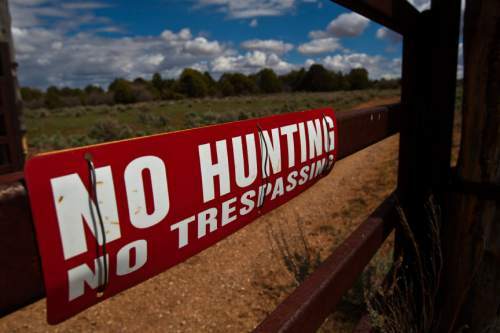 Chris Detrick | The Salt Lake Tribune A sign at the entrance of Chris Odekerken's Elkheart Cliff Ranch on his property on Glendale Bench Wednesday May 8, 2013. Chris Detrick | The Salt Lake Tribune Rancher Chris Odekerken drives his truck on K 2855 on his property on Glendale Bench Wednesday May 8, 2013. Chris Detrick | The Salt Lake Tribune K 2855 that runs through rancher Chris Odekerken's property on Glendale Bench Wednesday May 8, 2013. Chris Detrick | The Salt Lake Tribune K 2855 that runs through rancher Chris Odekerken's property on Glendale Bench Wednesday May 8, 2013. 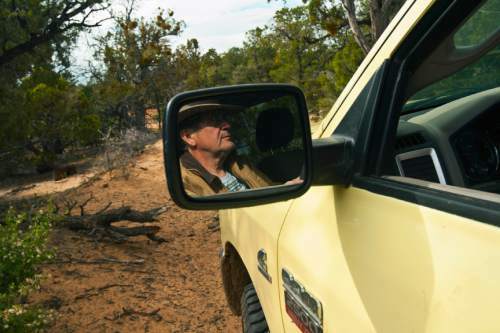 Chris Detrick | The Salt Lake Tribune Rancher Chris Odekerken drives his truck on K 2855 on his property on Glendale Bench Wednesday May 8, 2013. 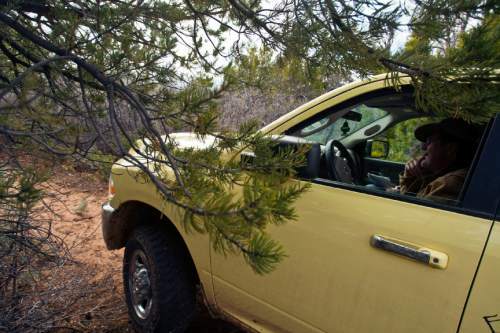 Chris Detrick | The Salt Lake Tribune Tree branches scrape rancher Chris Odekerken's truck as he drives on K 2855 on his property on Glendale Bench Wednesday May 8, 2013. 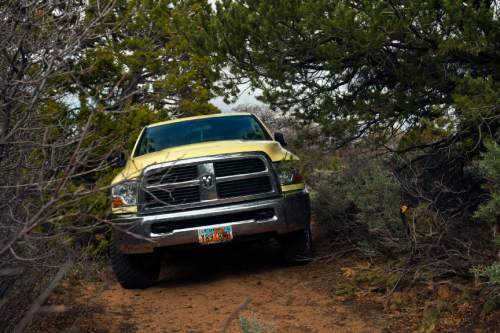 Chris Detrick | The Salt Lake Tribune Tree branches scrape rancher Chris Odekerken's truck as he drives on K 2855 on his property on Glendale Bench Wednesday May 8, 2013. 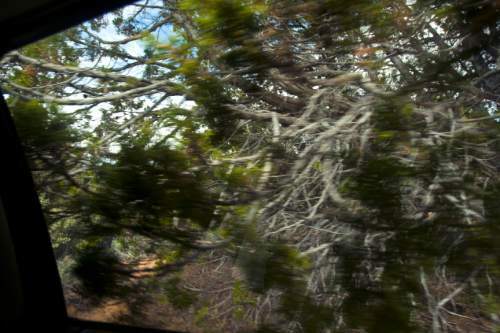 Chris Detrick | The Salt Lake Tribune Tree branches scrape rancher Chris Odekerken's truck window as he drives on K 2855 on his property on Glendale Bench Wednesday May 8, 2013. 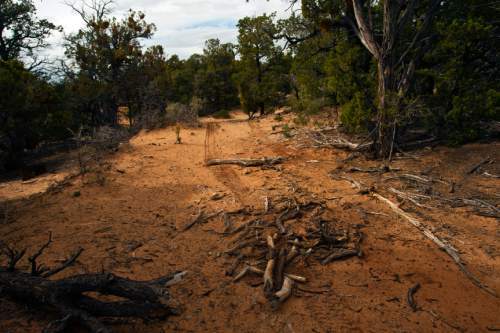 Three federal judges are asking the Utah Supreme Court to clarify the meaning of a short section of Utah law that has big implications for counties&apos; claims to roads criss-crossing federal lands. 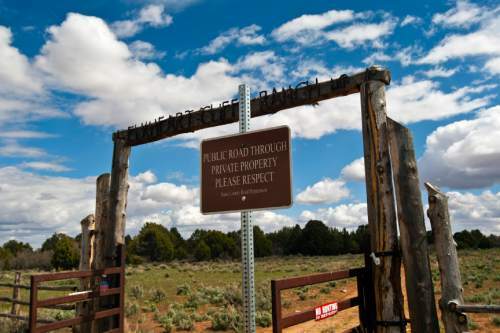 Counties, joined by the state, have filed more than 20 federal lawsuits in recent years, trying to get control of more than 35,000 miles of roads or road segments under a Civil War-era statute known as RS2477. On Friday, though, U.S. District Judges David Nuffer, Clark Waddoups and Robert J. Shelby sent an order to the Utah Supreme Court asking, essentially, whether Utah law bars the lawsuits. 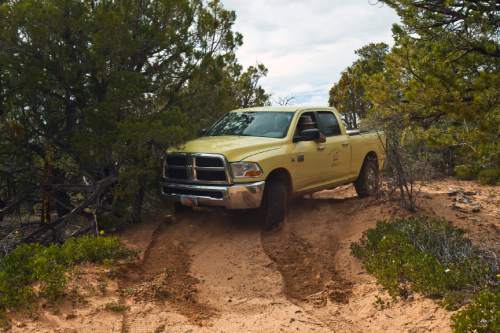 The Southern Utah Wilderness Alliance, an intervenor in the federal cases, argues that the Utah Code has a seven-year "statute of repose" that means any lawsuits making a claim to the roads had to be filed by 1983, seven years after RS2477 was repealed in 1976. The first of the lawsuits was not filed until 2011. 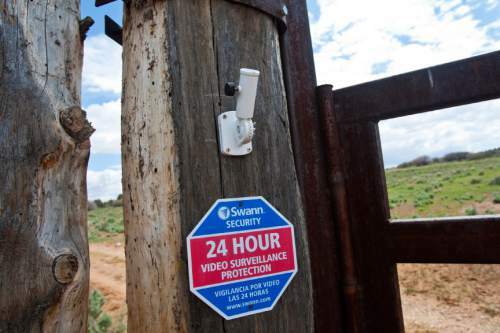 The federal judges write in their order that "If SUWA&apos;s assertion is correct, then the R.S. 2477 Road Cases pending before this court would be barred." 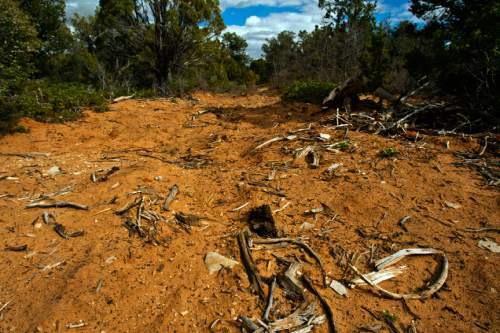 But if the code is interpreted as a "statute of limitations," the seven-year clock may not have begun ticking until the counties discovered they were injured by federal action to close the roads, according to case law cited in the order. The federal judges ask the Utah Supreme Court to answer this question of law: "Are Utah Code 78B-2-201(1) and its predecessor statutes of limitations or statutes of repose?" It&apos;s not clear how soon the Supreme Court will take up the question. In an apparent response to SUWA&apos;s challenge, the Utah Legislature this winter passed a bill, retroactive to 1972, specifying that the statute of limitations doesn&apos;t apply in cases involving claims against the federal government for real property. HB401 was sponsored by Rep. Mike Noel, R-Kanab. Last week, Waddoups took the unusual step of issuing a temporary restraining order to block a state judge from hearing a lawsuit involving Tooele County&apos;s RS2477 claims.Tooele County resident Michael Abdo and SUWA filed the lawsuit in 3rd District Court last summer. Waddoups agreed with state attorneys that it was an "end run" around his jurisdiction in Tooele County&apos;s federal case, pending since 2012.